The Earl’s Valentine was a limited edition Valentine’s Day tea put out by DavidsTea. The review is coming to you in March because it took me a while to track down the tea as it was sold out in stores near me. I was first introduced to The Earl’s Valentine last year. I had bought a small bag to sample, less than 25g, and when I had the first cup I was hooked! And then I tried to go back to the store to buy more and it was already sold out and long gone by the time I went back (a day or two after Valentine’s Day). This year, I tried to go to the store ahead of time, but it had been delayed getting to the local stores. And by the time the stores did get it in stock, I was told a lot of them only received 1 kilo of The Earl’s Valentine and many of the sold out the same day. I wound up buying two 50g bags online so I could get my fix. This tea is a black tea, the dry leaf smells heavily of chocolate oranges with a hint of floral goodness. You can thank the chocolate and the bergamot for that wonderful mix. It reminds me a lot of the Terry’s chocolate oranges that are often on sale around Christmas time. The Earl’s Valentine is made up of: roasted carob, black tea, chocolate pieces, rose buds, cornflower petals, natural and artificial bergamot, chocolate and cocoa flavorings. There is also the addition of an allergen warning that this product contains milk and soy. DavidsTea recommends steeping The Earl’s Valentine in 96°C (205°F) water for 4-7 minutes. I steeped for about 5 minutes. The Earl’s Valentine steeps to a surprisingly not murky orange colour. I say surprisingly because I find that most teas with added chocolate often isn’t clear. This one isn’t too bad. When taking in the aroma of a freshly steeped cup of The Earl’s Valentine, you can really smell the bergamot with a hint of chocolate. The smell of roses was more present in the dry leaf than the steeped tea, but some floral notes are in the smell and taste of this tea. The bergamot isn’t as strong in this tea as it is in DavidsTea’s Organic Cream of Earl Grey, but it is still enjoyable. I really like Earl Grey teas in general, so this one does hit the right notes for me – Earl Grey teas with a twist generally make me happy. I did wind up adding just a bit of sugar to this tea. I found that despite the addition of chocolate, it wasn’t sweet enough for me. The addition of sugar does help to brighten up the bergamot and chocolate flavours in the tea, so I would recommend adding some sort of sweetener if you can. There is a bit of an oily layer on the surface of this tea, this would be from the melted chocolate. It’s not unpleasant, but this is the type of tea that I would recommend having hot or mixing with milk or cream so you’re not subjected to the oily surface layer when the tea is cooled or cold. I attempted to resteep The Earl’s Valentine and found that it didn’t resteep very well as many of the flavourings that I loved in cup one were gone by cup two. This is another one of those one steep wonders. 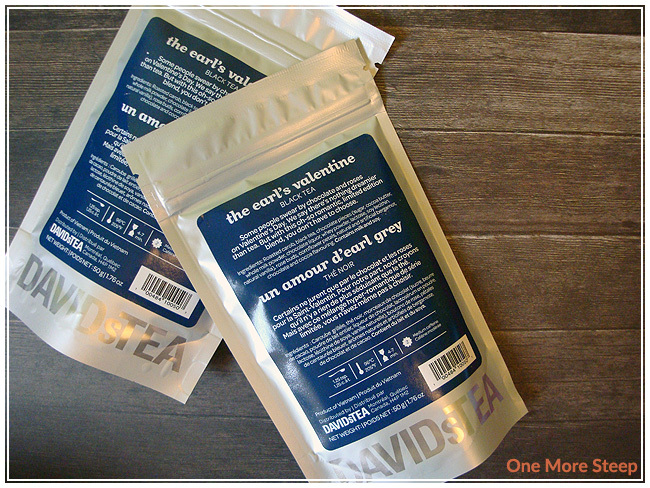 I liked DavidsTea’s The Earl’s Valentine. Perhaps I was waxing nostalgia when I went on my hunt to find this year this year, because I only had so little last February, or it could be that the formulation of this tea had changed between last year and this year. 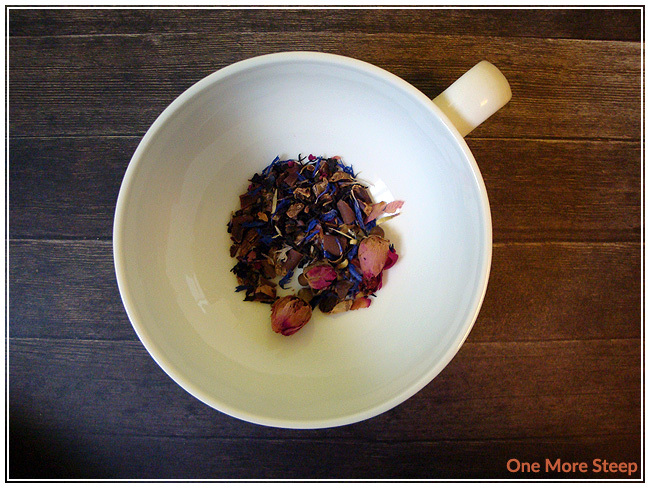 The Earl’s Valentine is a good alternative to the classic/plain Earl Grey, so there is definitely that. I find the combination of chocolate and bergamot to be very tasty, and the floral notes left by the rose buds in the tea make me feel like I should be having this as part of a tea party. 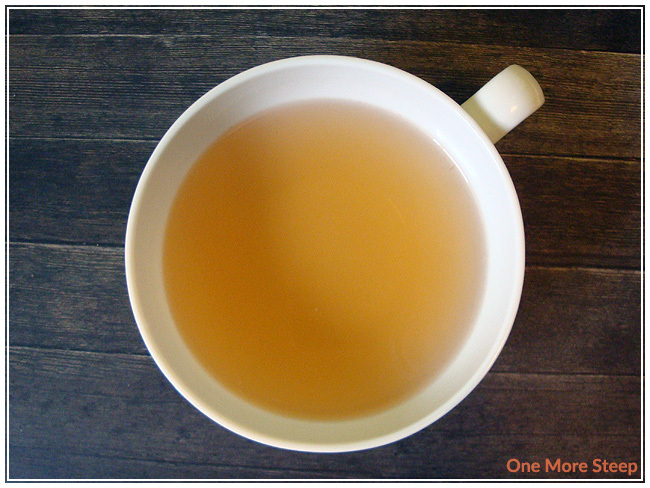 I would recommend adding a sweetener to this tea, as it does help brighten up the flavours a lot.